- Constructed of Tough PVC Material is water and chemical resistant. - High Density Foam inner padding for superior protection for your firearms. - Heavy Duty Lockable Metal Double Zippers (small padlock not included). - Five external rifle Magazine Pouches with hook and loop flap to secure the magazines in place. 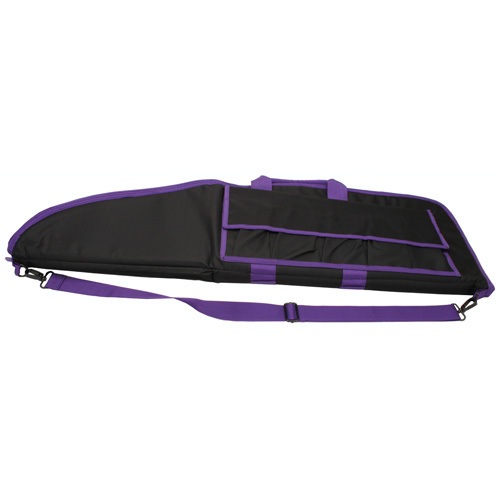 - Adjustable Shoulder Sling included, clips onto Metal D-Rings sewn onto the Rifle Case. - Heavy Duty Carry Handle Straps with hook and loop flap. - Measurements provided are the outside overall length & height of the gun case. It is recommended to purchase a Rifle Case that is 2" longer than your rifle's overall length. - I.D. Holder on the Outside of the Case.